Slick and Stylish Action Thriller.Dhruva is a much awaited break for Ramcharan. Even if you have watched ‘Thani Oruvan,’ the impact won’t be downsized. Surender Reddy and Ramcharan have to be appreciated for remaining so obedient to the original. Ram Charan's acting as an IPS officer has enacted phenomenally and has proved his individuality. Siddharth Abhimanyu's style of acting is outstanding and his strong attitude is the strength of the movie. 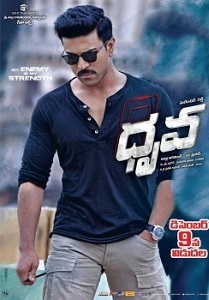 Dhruva is a perfect mixer of all the commercial elements like romance, glamour, action and thrills. The stealer cast add depth and intensity to the narration, while superb music and impressive cinematography enhance the overall experiences. Thrilling Duel.Dhruva is worth every penny for its strong script and thoroughly engaging screenplay. It is the first step for Charan who is desperately seeking an image makeover. Dhruva is a hit added to the kitty of Ram Charan and have to wait how huge it turns out to be in coming days. Dhruva is a perfect comeback film for Charan. He should be credited for choosing a unique film like this and giving his best through a standout performance. The engaging narration, interesting twists and some superb mind games are huge assets of this film. The film will impress each and every section of the audience and is bound to do well. If you ignore the small glitches here and there, this film is a perfect action entertainer to watch out this weekend. Dhruva turns out to be a stylish thriller.There is nothing to talk about story, screenplay and direction as Surender Reddy adopted everything from the original. It has to be seen how mega fans, masses, family viewers accept Ram Charan's complete changeover. The movie is full of thrill and suspense with no masala or romance in it. Dhruva is a well-made action entertainer. Ram Charan's standout performance engaging narration, interesting twists and some superb mind games are huge assets, even though there are some minor glitches here and there. Try it! Dhruva is a must watch film for audience who enjoy thrillers and unique subjects. Dhruva promises to be an edge-of-the-seat entertainer and it delivers impeccably. You won’t find yourself looking away from the screen through the two-hour-forty-minute runtime. Go watch it. Solid story, engaging screenplay and riveting performances make Dhruva an intelligent thriller which is at par with any of Hollywood or Korean films (thanks to Mohan Raja). Go and watch it!